Microsoft Company Information Is this your company? Add your own content to this page. We currently have 2 open jobs at Microsoft. We've calculated that the average salary at Microsoft is $81K based on 5,760 user-submitted salaries A total of 845 Microsoft employees gave Microsoft an average happiness rating of 3.9 out of 5.0. 316 Program Managers from Microsoft submitted salaries. 4.1 I worked for Microsoft for about eight and a half years at a remote location in Hauppauge, NY on Long Island. Microsoft acquired a small local company named Sybari back in 2005 and that's how this location came to be. Saybari specialized in antivirus protection at the corporate level. Ultimately we wound up under the Exchange division building a management console for O365 and Exchange Online Protection. At one point we were about 100+ people strong, but through layoffs and attrition we were down to about 35 when the final blow was struck in July 2014. They shut us down as a part of the recent head count reduction. Working at Microsoft was a real crazy ride. Because I was working with an extraordinary group of people, I don't think I felt the pain as much as I would have if I was working with people I didn't enjoy being around. The work was tough and demanding. You were expected to drive whatever feature you were working on. Scheduling was terrible. Every time I worked on a new feature the first thing I was told was "you are behind". I would say, "how can I be behind, you just showed me this today." Also, the egos in the company were way too big for my liking. I did learn a lot about process and how software is built on a grand scale. That is something that I am glad I took away from the experience. Of course the benefits and pay were quite good. Also being 13 mins from my home was a huge personal plus. All in all, I am glad I worked for them. It is a once-in-a-lifetime experience. As with any job, there was good and bad. Had they not closed the facility, I would still be there. 5 Bar none, Microsoft is the best company that I have worked for. Why? Solid management, employees are well taken care of and well compensated. Well defined career path and every one is given the opportunity to succeed, excel and contribute to the financial goal of the company. For me it was 16+ years of excitement, commitment and rewarding fun work. Everyone at Microsoft is motivated to push boundaries. The company constantly observes how customers use its products, so it can consistently improve them. Solving problems and making breakthroughs is all part of the daily routine. • The Entertainment and Devices Division deals with developing advanced entertainment platforms, such as the Xbox games console. It also works on portable entertainment solutions and developing new technologies for next-generation devices. • The Online Services Division creates and maintains online content, including the Bing search engine and MSN portals. • The Windows & Windows Live Division develops the popular Windows operating system, as well as the Windows Live platform, which delivers software and services over the Internet. • The Microsoft Business Division is responsible for developing business productivity and management solutions, such as the widely used Microsoft Office suite of applications. • The Server and Tools Division develops the software that drives servers. Software development tools and platforms are also created here. Microsoft is a large corporation that employs a wide range of computer-literate professionals in software development, sales, consultancy, customer support and many other fields. As well as offering competitive salaries and stock options, the company prides itself on its care for its employees. This includes a generous Microsoft benefits package, paid leave for new parents, and matched charitable donations. The company also nurtures learning by providing support for undergraduate and graduate studies, as well as offering more than 2,000 internal training programs. To view a full listing of Microsoft jobs, view the results below. 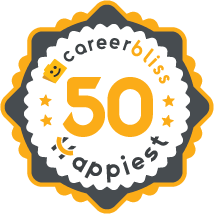 Feel free to register as a CareerBliss user and set up Microsoft job alerts so you can be notified when new positions open.